1. 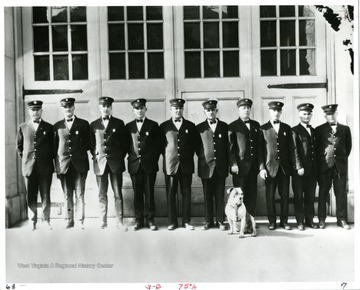 Morgantown Fire Department Members, Spruce Street, Morgantown, W. Va.
Morgantown Fire Department Members, Spruce Street, Morgantown, W. Va.
Members of the Morgantown Fire Department, from left to right: "Chief John Hare, John Rich, Mearle Devaughn, Homer Zearley, William Sherman, Rolla Dutton, Plummer Pride, Harry Feck, Dorsey Stalnaker and Friend Barrett. The dog is "Doc," the mascot. 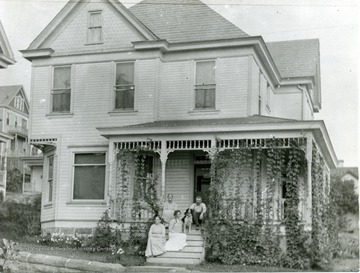 "Photo appeared in the Morgantown Post on February 23, 1927. 2. 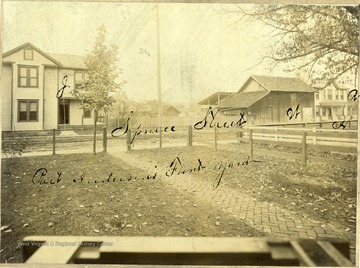 Spruce Street, Morgantown, W. Va. Spruce Street, Morgantown, W. Va.
3. Home Located on Spruce Street, Morgantown, W. Va.
Home Located on Spruce Street, Morgantown, W. Va.
Home on Spruce Street in Morgantown, W. Va. People, possibly a family, sit on the front porch and steps with their dog. 4. 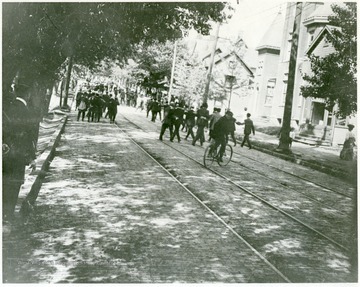 Parade on Spruce Street, Morgantown, W. Va. Parade on Spruce Street, Morgantown, W. Va.
People walking down Spruce Street. 5. 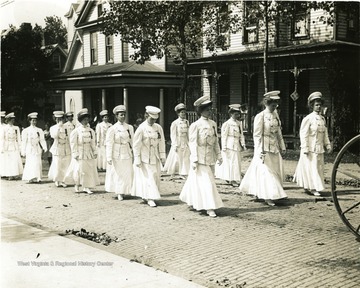 Women's Christian Temperance Union Marching on Spruce Street, Morgantown, W. Va.
Women's Christian Temperance Union Marching on Spruce Street, Morgantown, W. Va.
6. Corner of Pleasant and Spruce Streets, Morgantown, W. Va. 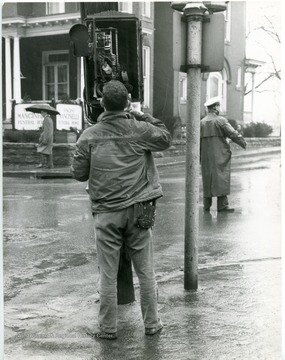 Corner of Pleasant and Spruce Streets, Morgantown, W. Va.
Repairman working on equipment at the corner of Pleasant and Spruce St.s with the Vincent Mancinelli funeral home visible in the background. 7. 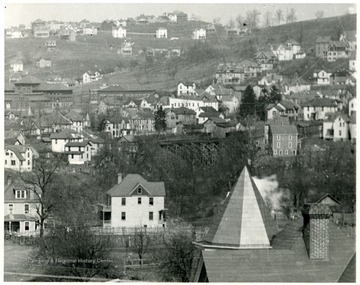 View of Morgantown, W. Va.
View of Morgantown, W. Va.
View of area of North High St, Wiles Hill, Spruce St. and Forest Ave. showing the bridge across Deep Hollow Run in Morgantown, W. Va.
8. 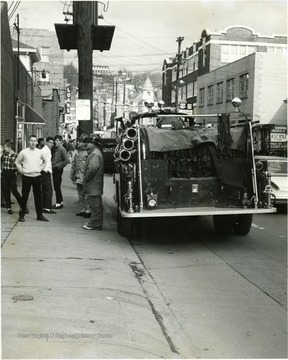 Fire Engine and Firemen on Spruce Street, Morgantown, W. Va.
Fire Engine and Firemen on Spruce Street, Morgantown, W. Va.
9. Parking Lot on Corner of Spruce and Pleasant Street, Morgantown, W. Va. 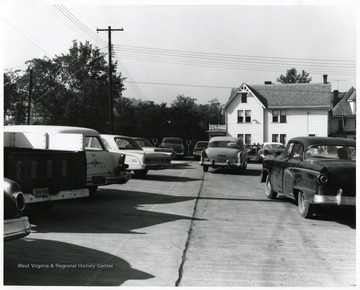 Parking Lot on Corner of Spruce and Pleasant Street, Morgantown, W. Va.
View of cars in the parking lot on the corner of Spruce and Pleasant St. Morgantown, W. Va. with Hastings Funeral home, formerly Hardigans Hospital. 10. 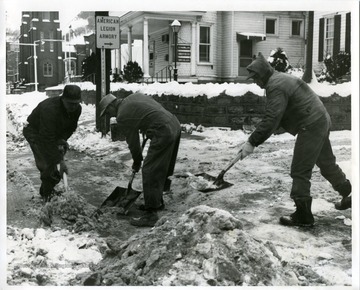 Road Crew Shovels Snow on Spruce Street, Morgantown, W. Va.
Road Crew Shovels Snow on Spruce Street, Morgantown, W. Va.
Three road crew members are shoveling a snowy sidewalk. 11. Snow Plow on Spruce Street, Morgantown, W. Va. 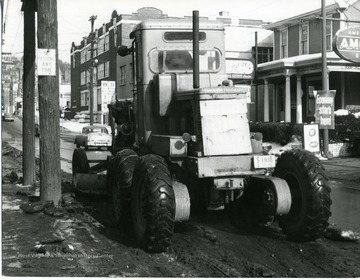 Snow Plow on Spruce Street, Morgantown, W. Va.
12. 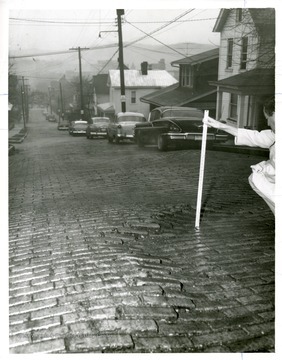 Street Brick Damage on North Spruce Street, Morgantown, W. Va.
Street Brick Damage on North Spruce Street, Morgantown, W. Va.
A man is measuring depth of street brick subsidence on North Spruce Street in Morgantown, West Virginia.